What a whirlwind of a weekend! 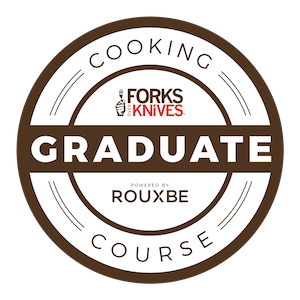 A great and productive weekend, but also exhausting! 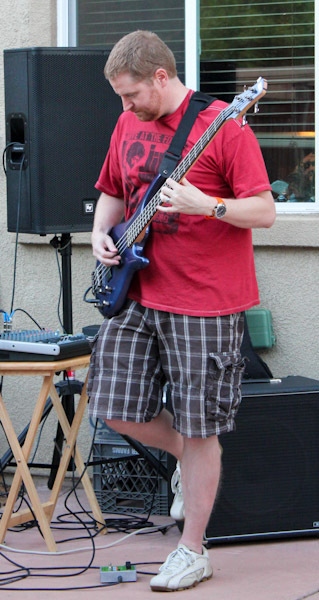 Last night we went to a birthday party for the singer in hubby’s band where, of course, the band played an awesome cover set for the party and I got to watch hubby rock out on bass. I’m so proud of him, the band has grown a lot in the last year and ready for more gigs! And what made the night even more fabulous is the singer and his wife follow a mostly vegan diet, so a baker friend made an amazing vegan microphone cake that was part peanut butter, part dark chocolate, and all amazing! 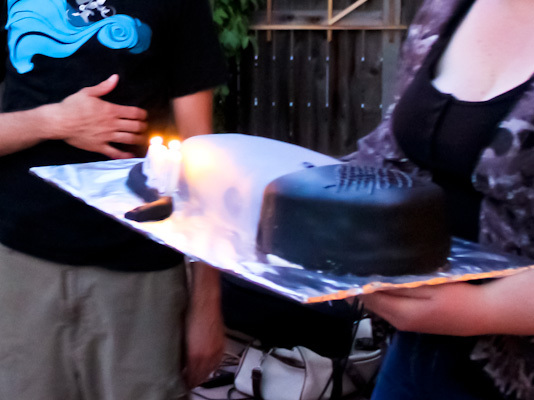 The chef said the vegan fondant was a pain which I wouldn’t know a thing about since I’ve never worked with fondant. But it’s been ages, and I mean ages, since I’ve had traditional sheet cake since I don’t make it at home and most versions at parties I’ve been to are not vegan. Plus I recall them being dry and not that tasty. But this cake was amazing! I had to try a small piece from each flavor and what a treat, it was so moist with a fabulous peanut butter icing in the center – not dry or over sugary as cheap sheet cakes can seem. At the same time it’s been awhile since I’ve had something that sweet and I felt a little jittery and nauseated after. 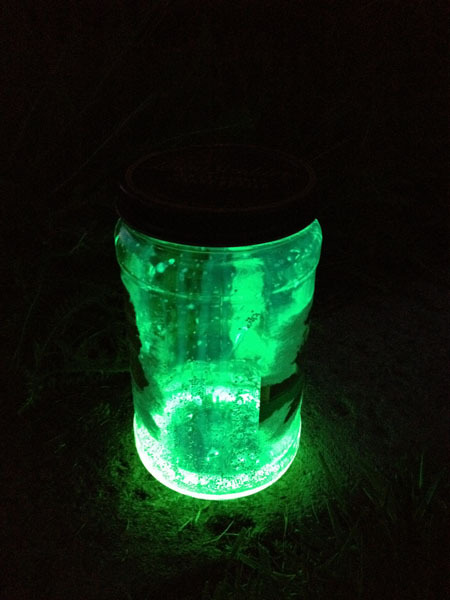 I also learned a cool trick from the hostess of the party, she broke open non-toxic glow sticks and dumped the contents into a jar with glitter to make a fun yard lamp while the band was playing. We had a few colors of glowing jars all around the patio for a cool effect. The kids were having a great time carrying these jars around shaking the contents. Today was a long and exhausting day that started out with my long run as part of my half-marathon training plain. Thankfully the early morning weather was cool and pleasant, but I was feeling the distance afterwards. 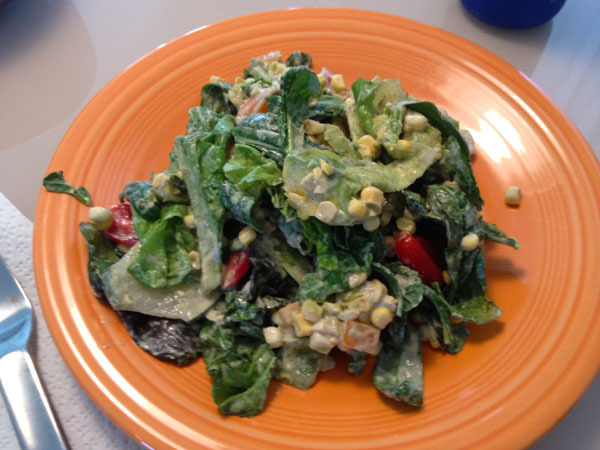 Then I headed over to my mom’s for a quick lunch of salad leftovers from the salad I took to the party – a mix of romaine lettuce, corn, tomatoes, avocado, and bell pepper with the Miso Hemp Butter salad dressing from Kristen Suzanne’s raw vegan hemp recipe book. Just as good the second day, maybe even a little better after the salad marinated in the dressing. Then I spent hours helping her move which wasn’t easy since she’s moving from one upstairs town home to another, neither with elevators. We moved five carloads of stuff, mainly books, kitchen tools and appliances, and other loose items the movers probably wouldn’t move. I lost count of how many times I went up and down stairs carrying loads of bags and boxes, many times over the course of 4 hours … after a long run this morning. Truthfully I’m not sure how I’m still functioning after such a long day, a few years ago I probably wouldn’t have made it through such a busy and productive day. I guess I can thank my current diet and lifestyle for being able to function through such a day. Between me and my sister we moved mountains for my mom which was awesome. And we still had energy to go out for dinner after at a casual Vietnamese restaurant since we were pretty sweaty and gross. 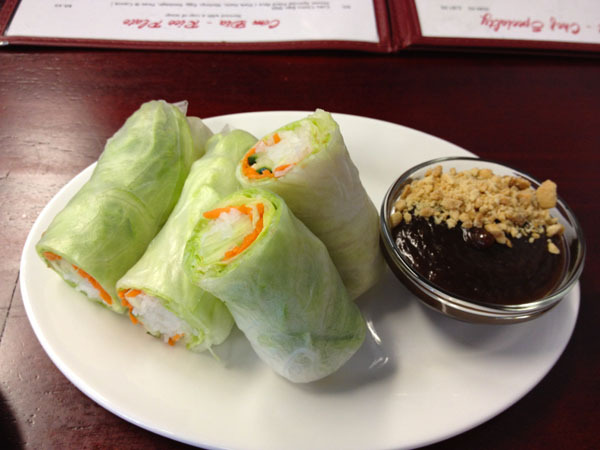 We started with the veggie spring rolls with peanut dipping sauce. The sauce was the star here and the rolls disappeared fast! 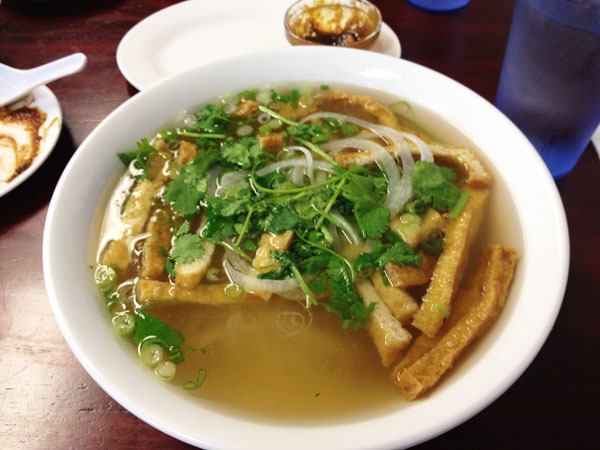 I got a huge tofu rice noodle soup for the main dish. It was gorgeous with fresh mung bean sprouts, basil, and I added red pepper flakes and a drizzle of spicy oil for a little flare. Perfect way to end a long and exhausting day. Now, if you’ll excuse me, I’m gonna soak my sore legs in a steamy bath with a glass of wine as I mentally prepare myself for the work week.